The key to Acquire is buying stock in companies that will survive (big payoff in the endgame) and in companies that will merge (liquid assets during the game). One good way to find liquid assets is to find the two companies that are closest to each other. Chances are, they will merge first (or soon, especially if there are three or fewer tiles separating them). If you have tiles to make one of these companies larger, buy stock in the smaller one. This ensures that you will likely have liquid assets (and hopefully a majority bonus!). You definitely want to be on the “absorbed” side of the initial few mergers, but only if you can be first or second. The biggest win is by successfully rolling over a majority stake several times in small chains. The trick is to judge when the best time is to take shares or cash instead of keeping the shares in the absorbed chain. Trading lots of shares into a bigger chain is called “suckage”. Don’t engage in share-buying wars over control. You may win, but if you’ve spent too much money in one place, you’re probably doomed. A common counter tactic is to deliberately re-form absorbed chains in an isolated part of the board, where the chain will not have the opportunity to merge again. Another counter tactic is to deliberately enlarge chains that someone else controls, preventing them from becoming the absorbee, and eventually preventing them from being merged at all. It’s true this gives your opponent a guaranteed payout, but only at the end of the game. 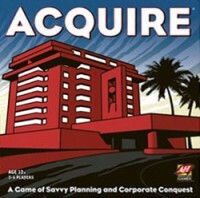 The key in acquire is turnover. Having all your money locked in a big chain (too early in the game) is death. Once you merge one of your hotel chains that got swallowed up by another, the temptation is to cash out right away or trade in for stock of the new hotel chain. I almost never trade in for the new corporation unless it gets me closer to majority ownership. You have to realize that part the game is not just about owning the most stock in a chain, but also about turn over with merges for big payouts. Holding back the stock of the defunct hotel chain gives you an opportunity to bring it back for another payout as the game progresses and draws closer to the end. It also works great if everyone else has dumped their shares. As the game progresses, you begin to see which hotel chains dominate the board. Place the defunct chain back onto the board close to one of those dominant chains, so it can get gobbled up again in another merger. Maybe not too close, unless you’re looking for another quick buyout, then you can grow it a little before the next merger to increase the buyout. If you bring the defunct chain back into the game and you’re the only one holding stock, you’re automatically the majority stockholder. Plus, placing the defunct chain back onto the board gives you an opportunity to ensure your primary shareholder stake, because you can buy up more stock in that new chain. Basically, you’re taking your initial investment and turning it over for another payout. You are increasing your return on investment (ROI) ratio. If you can do this 3 or 4 times during a game with a single chain, then you’ve made a good investment on a single hotel chain. Always try to start off with a mid-costing or a high-costing tower if you can. Even though a low-costing tower will save you money in the short-game, odds are your first tower will break. Also, you must [re-read that] MUST make sure you are able to merge your first, or at the very least, second tower. Without this, you will be without money to purchase other tower shares. Remember that for each type of stock, there are only 25 cards, so there is really no need to go crazy and buy up all of the stock you can from 1 company. As soon as you have 13 stocks from 1 company, you are the majority shareholder. A normal course of the round will look like this. Someone will create a new hotel and they will buy their three stock. Then the next person may create a new hotel and buy their stock in their hotel. The next person will not create a hotel and will chose which stock they want to buy from the previous two. This will continue for a while and all is good. A few players will get wrapped up in a race to get the most and stay ahead and the majority. This is your time to strike and make a quick buck. Look for the stock that everyone has forgotten about, and hopefully you know who has it and what they have, but more importantly, know who the minor is. Sometimes, when the late stocks to come out there is no minority holder. The creator of the stock has theirs, but the other players are fighting for the majority in their own race. In this case, investing a few hundred in a small stock that is going to be acquired soon will reward you with a minority bonus. It may not seem like much, but our games are won and lost by a few hundred dollars. The little things like this will not only put a few hundred dollars in your hand, but take a few hundred out of the person holding both the majority and minority. 1st The most important thing to consider is your current level of cash. You will always want to have cash on hand. If you do not keep cash on hand it will put you at a distinct disadvantage as the rest of the players will continue to purchase stock. Additionally, it will feel like you are not really playing as there is nothing for you to do other than lay tiles. 2nd What are the chances of this stock coming back out? The game may have progressed to the point where it is no longer possible or highly unlikely that this hotel will come back again. In this case sell or trade, but if you get stuck with a stock in your hand that is not on the board, you’ve just lost money. 3rd It may not be necessary for you to keep all the stock you have acquired. Try to figure out who is also keeping some of the stock back and who is selling. Keep only what you need to be the majority and sell the rest for the extra cash. This is especially helpful when you can bring this hotel back onto the board on your next turn. 3B It is even more so helpful when you know this stock will go up in price from its current position. Remember the purpose of the game is not to create the biggest hotel, but to collect the most money. Early in playing it can be easy to get caught up in this idea. However, it is often best to diversify your portfolio (just like in real life) and work toward being the Majority and Minority shareholder in a few different hotels and then flipping those chains for the bonus cash. There are usually one or two hotel chains that your opponents will overlook because they are chasing the largest hotel and it will only take a few purchases to get you in the bonus. Looking for this opportunity throughout the game can give you the buying power others will be lacking toward the end of the game. I’ve explained below when you should keep your stock so here I’ll dive into the other half. I’ve seen this concept cause some mental strain on players so I will try to explain in simply here. Once your hotel is acquired by a larger chain you have the option to keep, sell, or trade your stock. You can trde your stock 2:1 for stock in the hotel it has been acquired by. I think people get caught up strategically as to what they should do, but for the most part it is a simple math problem. Lets say you have two shares and $200 each. If the hotel you’ve been acquired by stock is over $400 then you will be making money. This is a safe trade. If it the hotel you’ve been acquired by is under $400 then it is a bad trade and you would be losing money. The only exceptions I could see to this would be if you were willing to lose a few hundred dollars if you saw something looming on the horizon where you could trade your stock 2:1 and become a majority or minority just before an oncoming acquire. If you have tiles in an area of a company, then you should buy a lot of stocks from that company. Then you place the tiles so that the stocks you bought are worth way more. This could be the game clincher for you. Then if that company merges you can trade them in to a bigger company. You get rich fast! One of the things that Acquire lacks compared to Monopoly is the ability to trade. This can easily be added into the game. Just make a rule after the player buys stock, he or she can then try to trade stock with for other people’s stock. This can add a fun negotiation factor to the game to liven things up a bit!